1: Make Something for Yourself! It’s so easy to get sucked into a perpetual cycle of making things for other people. Someone needs a present. Someone needs socks. Someone is having a baby (and then someone else is), someone is having a birthday – you could literally spend every stitch you crochet making things for someone else. This is your crochetcation, why not make something for yourself? And since you’re making something just for you, why not pick up something a little special to make it with? Something just a tiny bit nicer or softer or prettier than the yarn that you usually work with. Or, perhaps, if the budget allows, something wildly luxurious. You know, you can get a half-dozen skeins of Koigu or even an ounce of qiviut for less than the cost of a one-day pass to Disneyland. I’m just sayin’. 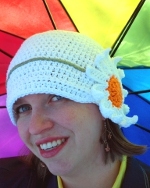 You can step outside the yarn store and crochet with something crazy! From plastic bags to t-shirts, twine, rope, wire, or embroidery floss, working with a new material may help spark a little creativity and a lot of fun. If you are fortunate enough to have a good local yarn store, you may be able to sign up for classes or workshops over the summer. This serves a double purpose: it allows you to learn something new and possibly make some new friends who share your passion. 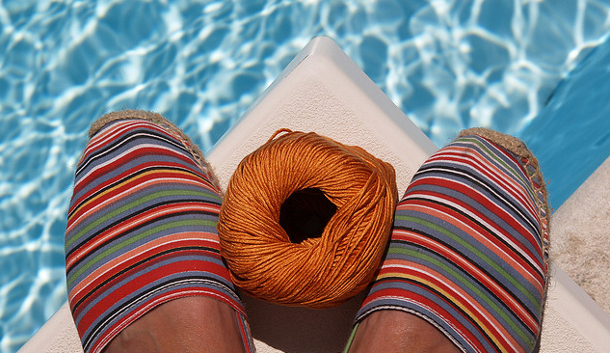 Whatever you choose to do, I hope you have a great summer filled with fun, friends, crocheting and – of course – yarn!